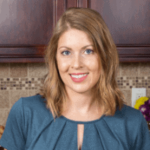 Published: May 2, 2017 · Modified: Apr 12, 2019 · By Jen Sobjack · This post may contain affiliate links. 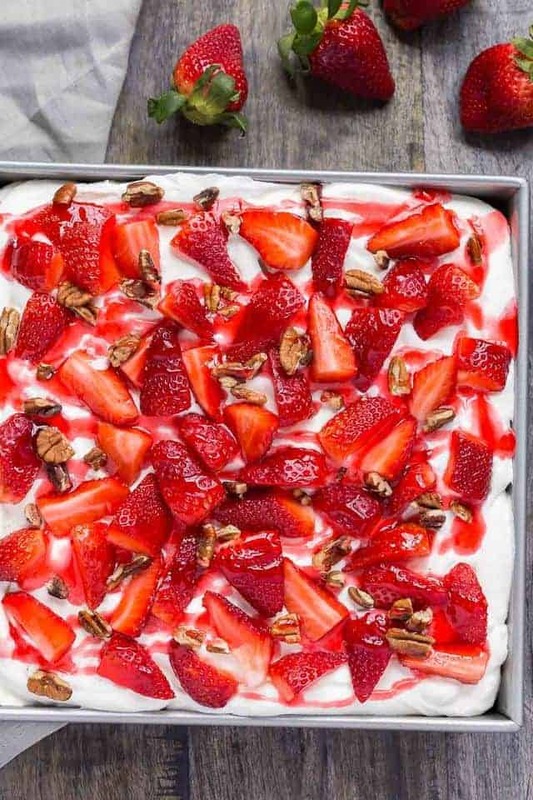 A Strawberries and Cream Icebox Cake is great to make because it’s super easy! No matter the occasion, this cake is always a hit. 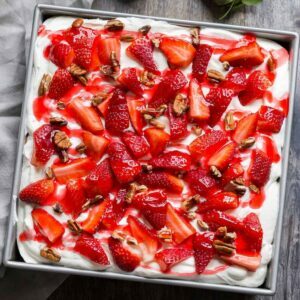 It’s a baked cake recipe with layers of strawberry syrup, whipped cream, and fresh strawberries. 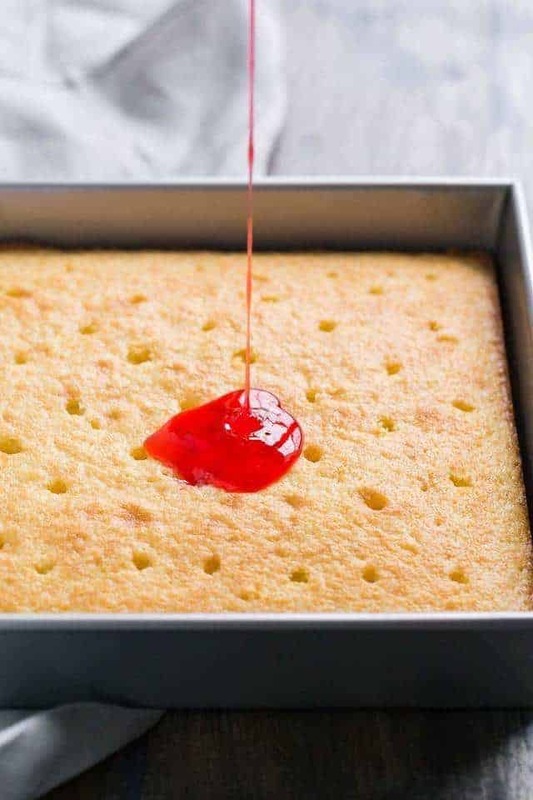 The vanilla cake is poked with holes all over the top so the strawberry syrup soaks into the cake making it extra flavorful. It’s light, sweet, and supremely delicious. Last month my husband had a birthday. We were traveling on his actual birthday so I made him a cake right before we left. And he actually liked it! If you remember from my strawberry shortcake cream cake post, you’ll know my husband doesn’t care for homemade cakes for his birthday. He grew up with boxed strawberry cakes and must have this each year. It’s a comfort food for him. This is a challenge for me because I want to bake him a cake from scratch, one that’s made entirely from love. We knew we would be celebrating his birthday away from home so we made no plans to do anything before then. But, I still wanted him to have a strawberry cake. That’s where today’s fresh and light strawberries and cream icebox cake comes into play. I decided on this cake because it’s not only great for a birthday, it’s perfect for Mother’s day as well. It’s actually good for any occasion during the summer months when you need a light dessert. And I know you are going to love it also! It’s a scaled-down version of my basic vanilla cake. I halved the entire recipe and baked it in a 9-inch square pan. The baking time will vary depending on your oven so keep a close eye on it. It will be dry like cornbread if it’s overbaked. Remove it from the oven as soon as a toothpick inserted into the center comes out with only a few dry crumbs. The tips for how to make the perfect cake still apply to this recipe. So be sure to take a moment to read over them. This recipe calls for cake flour. It contains less gluten than all-purpose flour so the cake will come out light and tender. If you don’t have cake flour, you can make your own. For every 1 cup of flour remove 2 tablespoons of flour. Then add 2 tablespoons of cornstarch for every 1 cup of flour. Sift 4 times and it’s ready-to-use as cake flour. Immediately after baking, use a wooden skewer to poke holes in the top of the cake and pour strawberry syrup all over. The syrup will seep into the holes adding flavor and moisture. I used store-bought strawberry syrup but you can try a homemade recipe like this fresh strawberry syrup. The topping is homemade whipped cream with fresh strawberries. It’s sweet and slightly tangy. The hint of tang comes from the use of sour cream. I think it gives a nice balance to all the sweetness. Just whip the cream, confectioners’ sugar, sour cream, and vanilla together until it’s nice and fluffy. Then, spread it over the top of the cake once it has cooled. 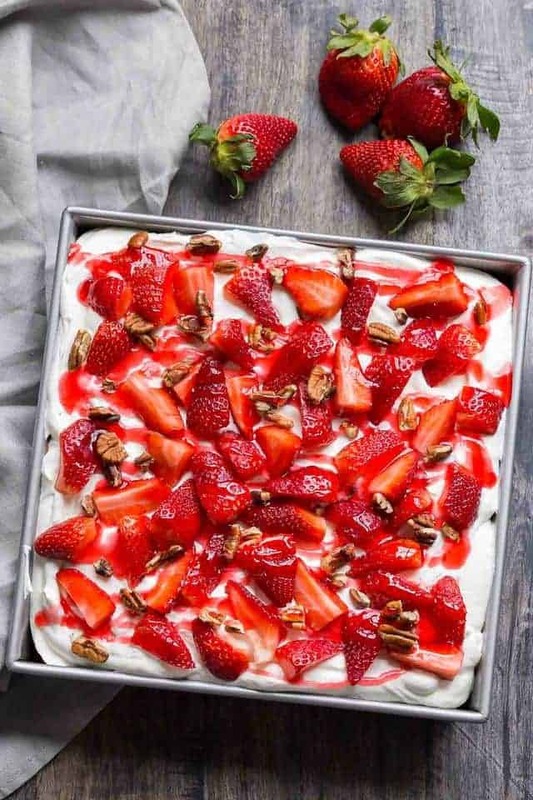 Top it with more strawberry syrup, fresh strawberries, and pecans if desired. 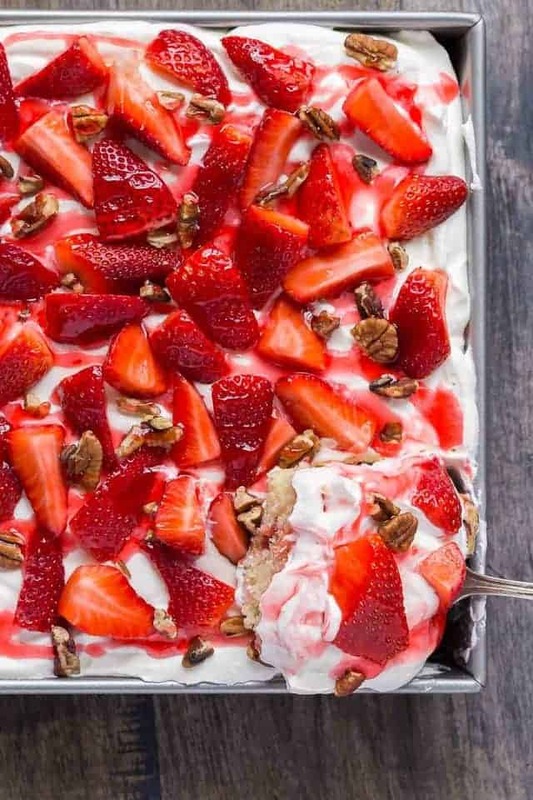 This strawberries and cream cake is definitely a must try this summer! Preheat the oven to 350°F. Grease and lightly flour a 9-inch square baking pan; set aside. In a large bowl, beat the butter and sugar together until light and fluffy, about 5 minutes. Add the eggs, one at a time, mixing well after each addition. Beat in the vanilla. Combine the flour, baking powder, and salt in a medium bowl. Stir with a whisk and add it to the butter mixture alternately with the milk, beating well after each addition. Spread the batter evenly in the prepared pan. Bake for 18-22 minutes or until a toothpick inserted into the center comes out clean. 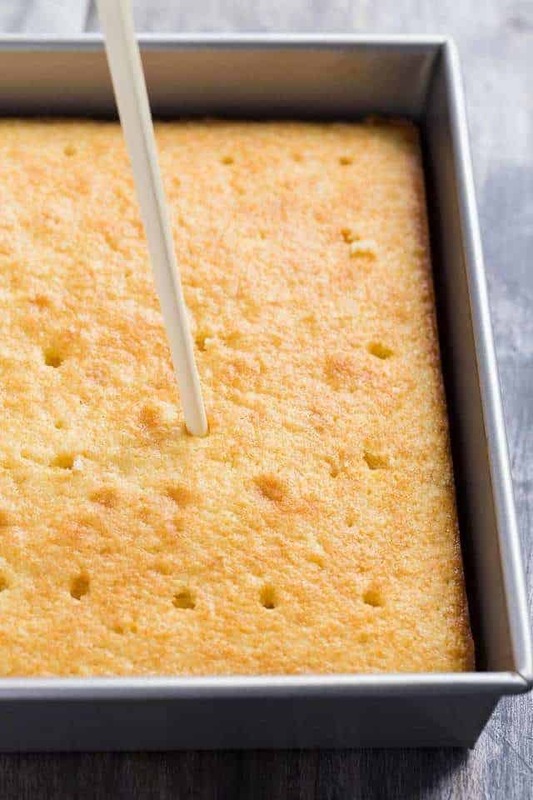 Using a fork or wooden skewer, poke holes in the warm cake. Pour the strawberry syrup evenly over the cake. Cover and refrigerate until chilled, about 2 hours. In a medium bowl, beat the heavy cream, confectioners’ sugar, and vanilla with an electric mixer on high speed until stiff peaks form. Spread evenly over chilled cake; top with strawberries and pecans. Drizzle with more strawberry syrup if desired. The cake is best served immediately but will keep for up to 6 hours covered and stored in the refrigerator. You can prepare the cake through step 4 and chill the cake for up to 1 day before continuing with the steps to make the topping. I don’t suggest freezing this recipe. *I strongly recommend using cake flour. You can make Homemade Cake Flour if you do not have it on hand.